What’s Queer About Queer Criminology? The term “queer criminology” is increasingly being used in criminological discussions, though there remains little consistency with regard to how it is used and to what it refers. 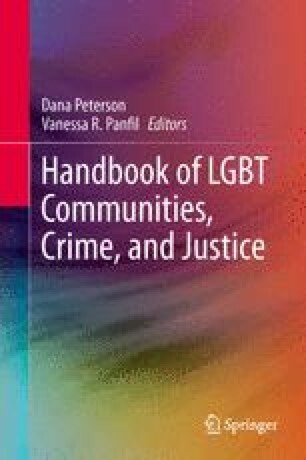 It has been used broadly to describe criminological research on LGBTQ people and their interactions with the justice system, more specifically to describe those analyses that identify and critique the heteronormative knowledges or binarized understandings of gender and sexuality within criminal justice research, and also to label theoretical and conceptual pieces that argue for a greater connection between queer theory and criminology. However, there are some important distinctions between “queer criminology” and “queer theory” more widely, particularly the deconstructive approaches of the latter. This chapter explores the engagements between queer theory and “queer criminology,” specifically focusing on whether “queer criminology” adopts an understanding of “queer” as an attitude, and as signifying a deconstructive project—a position that features in many strands of queer theoretical work. It will argue that while there are different ways of engaging with “queer” as a concept, and that each of these engagements produces different kinds of “queer” projects, “queer criminology” does not always engage with the deconstructive approaches drawn from queer theory. Ultimately, this can limit the ways that “queer criminologists” are able to address injustice. The author would like to thank the following people for their insightful comments on this chapter: Christian Callisen, Belinda Carpenter, Jo Phoenix, Jordan Blair Woods, Juan Tauri, Liz Morrish, Peter O’Brien, Angela Dwyer, Sharon Hayes, Vanessa R. Panfil, and Dana Peterson. Browne, K. (2008). Selling my queer soul or queerying quantitative research? Sociological Research Online, 13(1), 11. http://www.socresonline.org.uk/13/1/11.html.